We're delighted to be included in Earnshaw's "Born in the U.S.A." feature for their July 2012 issue! 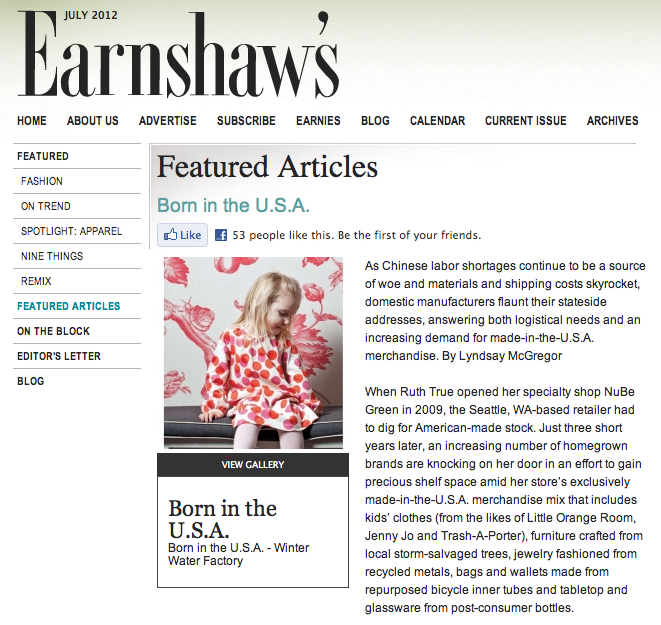 The article focuses on domestic manufacturing and the increasing demand for stateside-made products. "Even if domestic production is more expensive, for both buyers and manufacturers, supporting the U.S. labor force and American-made products seems like the right thing to do," according to the article. Says Stefanie Lynen, "All the money that I pay to make my product is paid to people who live in the community. They pay taxes on it and keep jobs here and money here and that gets reinvested in the community." To read the rest, click here. The Fall 2012 Collection Is Almost Here!